I admit I'm not the fastest writer in the world. Most times I shoot for an average of 500 words a day. My novels run about 75,000 words, which means I can knock off the first draft in 2-1/2 months. Allowing time for edits, critiques by my peers, and research, I need a full year to finish a novel. Now I've worked faster. I participated in Nanowrimo once and hit over 1K words a day, but not enough to make a full novel. Stephen King writes 2,000 words a day, minimum. Jack London had hit about 1,000 to 1,500 a day. Earl Stanley Gardner (Perry Mason fame) is said to have done one million words a year. And yet I poke along at a paltry 500 words on a good day. So, recently I picked up 2,000 to 5,000 by Rachel Aaron. This is a good book. 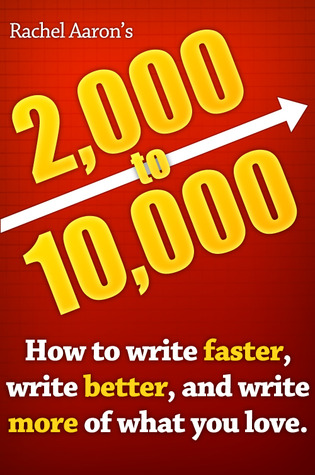 Only 63 pages by paper count, but packed with advice on how she does 10,000 words a day, and only 99 cents at Amazon. She tells that her novel Spirit's End took only 12 days from start to finish. Although she's full time writer that is still a grand success. Without giving away too much, the secret lies in organization. Rachel spells out in great detail how she does it. From the three pillar concept through plot and character development she tells all. This not a book on how to write, but a guideline to garnering skills to become more efficient. She also spells it out in her blog, but for 99 cents the book is a great investment and packed with so much more. Ron D. Voigts is the author of the Penelope Mystery series, and his first mystery for big kids, Claws of the Griffin, is due out next spring from Cool Well Press. I vary between 0 and 4,000. If I get to write I usually manage around 3,000 at a shot, but it doesn't happen every day. Interesting post. I remember reading somewhere that DH Lawrence wrote his novel Kangaroo in a couple of months ... edits and all. (Fascinating book, by the way.) And Robert Aickman, although he wasn't quick at all with his writing, would dictate to his typist the finished draft. And that was it, not a comma or full point was changed by anyone. I don't know if any writers get away with that these days. I've always wondered how many of us would be writing if not for word processors. Typewriters would certainly knocked down the numbers. Of course, dictating does have its benefits.